Located on the banks of the Arroyo, La Casita was designed in 1933 to be a community meeting house by Myron Hunt, renowned architect and a member of the Pasadena Garden Club. 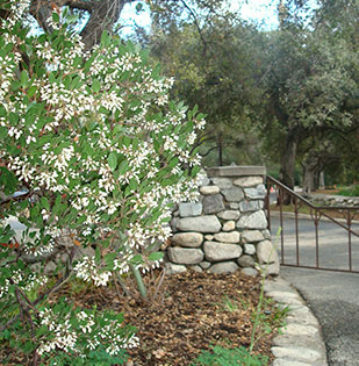 A joint venture by the Pasadena Garden Club which supplied the funds and the City of Pasadena which supplied the land, La Casita was built as a public works project to provide employment during the Great Depression. The original building was built of materials salvaged from the Arroyo and the wood velodrome ( bicycle track) built for the 1932 Olympics. In 1985, after a devastating fire, La Casita was rebuilt and restored by the City , and the Garden Club undertook, with the help of Isabelle Greene and Yosh Befu, to create a new garden that was comprised mostly of California native plants. This demonstration garden was designed to be educational as well as waterwise. A Butterfly sanctuary, built on the hillside leading into the Arroyo was created in 2010. The garden was maintained exclusively by the Pasadena Garden Club until 1994, when the La Casita Foundation was formed and took over the responsibility for the maintenance of the garden. It is still a community project of the Pasadena Garden Club, and was designated by the Garden Club of America at its Centennial, as one of the five most important garden club projects in the United States. La Casita has initiated a Plein- Air Art Collection to celebrate the beauty and history of the early Arroyo and is available to be used by individuals and local non-profit groups. For individuals, please contact the City of Pasadena.